Nashville, TN -- Mountain Home Music Company played host to media, friends and fans of multi-award-winning artist Kristy Cox for a celebration of the release of Part of Me. The event was held at Nashville’s Station Inn. Accompanying Kristy and a stellar band on stage was Jerry Salley, who produced and contributed his top-notch songwriting skills to the album. Brentwood, TN -- Several bluegrass and country music artists who have written hundreds of hits and/or performed with some of the industry’s biggest stars will perform in Brentwood, Tennessee, on Saturday, February 13, to raise money for a humanitarian program in Ecuador. 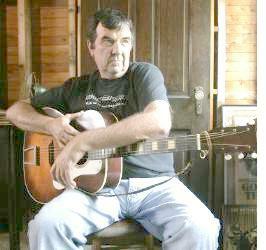 Songwriters Carl Jackson, Larry Cordle and Jerry Salley will headline the “Mission of Love” concert, along with acclaimed vocalist Val Storey. Proceeds will help fund essential needs of San Jose Obrero, Good Shepherd’s sister church in Mante Ecuador. Nashville songwriters Donna Ulisse & Jerry Salley recently had the opportunity to thank Del McCoury in person for recording their song "Butler Brothers". The song is a tragic and chilling story song about two brothers fighting on different sides in the Civil War and has been included on the highly anticipated new album The Streets of Baltimore by the Del McCoury Band. Inspiration for the writing team came from a document Ulisse's husband acquired out of a courthouse in Virginia about his great-great-great-great grandfather fighting against his own brother. Nashville, TN -- For the past few years, Music Row veteran songwriters/artists Carl Jackson, Larry Cordle, and Jerry Salley have been donating their talents in the form of a Christmas concert to benefit the restoration of the historic Strand Theatre in Louisville, MS, Jackson's hometown. Having performed as "The Trio" for over twenty years, it was in recent years at this particular show the powerhouse group attracted the attention of Republican Congressman Gregg Harper. Recently, the Congressman invited them to perform during the Republican National Convention on August 28th for the Mississippi Delegation power lunch.